Gingersnap cookies, heart-shaped Christmas lights, and Glogg (hot mulled wine with Aquavit, raisins & almonds) fill the stalls along the Copenhagen’s Nyhavn Canal. Pine trees, trinkets, bratwurst, fried potatoes, chocolate, hot candied almonds and dazzling Christmas ornaments will pull you in – powerful winter magnets. Tourists, couples and local families with bundled children mill around Nyhavn (New Harbor) -always picturesque with its colorful townhouses – and also around Copenhagen’s main Christmas Market in the city center. Smaller markets dot the residential neighborhoods. 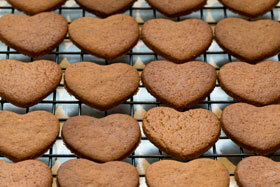 Cookie samples lure shoppers and gingersnaps (known as Pepparkakor) – are classics. Another favorite is cinnamon sugar cookies – crispy and often heart-shaped. They have perfect mates (coffee! cappuccino! hot chocolate!) in the bakeries and coffee shops of the city. Christmas markets dot European towns and capitals from Scandinavia to the Italian Alps. My visit to Copenhagen was in the first week of December and the holiday spirit was in full blossom. Maybe next year a Christmas Market Tour down the Rhine or the Danube? With a moment of silence in my heart for the people of the Berlin Christmas Market massacre, I continue to scheme & dream visions of sugar plums and cookies galore. 1. Lightly crush the cardamom pods so that the seeds can be emptied out. 2. 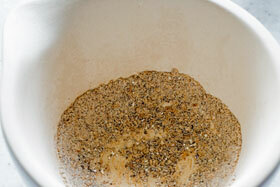 Grind the seeds in a pestle and mortar for a couple of minutes. 3. 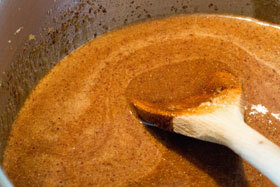 Mix the butter, sugar, syrup and treacle in a large saucepan. Heat gently until the butter melts, stirring continuously. 4. 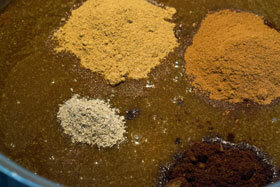 Turn off the heat, add the spices and mix thoroughly. 5. Add the baking powder and stir again. 6. Add the water and stir once more. 7. 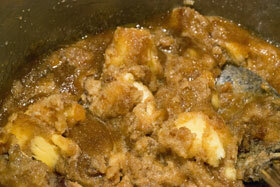 Add the flour and stir thoroughly until it is completely mixed in. 8. 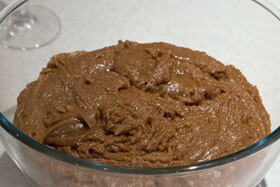 Empty the mixture into a bowl. When cool cover with cling film (food wrap) and then leave the dough to rest in the fridge overnight or, if you can, even longer (a week is ideal). 9. Preheat the oven to 200°C (400°F, gas 6, fan 180°C). 10. 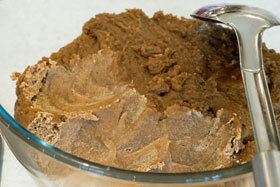 Take a small portion of the dough for a test bake and return the rest to the fridge. The dough will be very firm and hard to roll initially. Knead it to soften it a bit, but it is easier to work when it is cold and fairly stiff. 11. Roll it out thinly on a lightly floured surface or onto greaseproof paper. 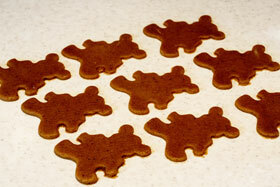 Cut into shapes using a biscuit (cookie) cutter. 12. Lift the biscuits on to cold baking trays (cookie sheets), lightly greased if not using greaseproof paper. Bake for 5-8 minutes until golden brown. Keep an eye on them as they burn very easily, but they should be crisp. 12. If the test batch spreads out and the biscuits lose their shape, add some more flour and do another test bake. 13. 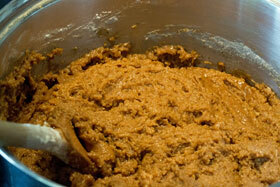 If the test batch is good, remove enough dough for another batch and return the rest to the fridge. Bake in batches until all the dough is cooked. 14. Once baked, leave to cool for a minute or two and then transfer to a wire rack to cool completely. The quantity below should be sufficient to ice a large batch of pepparkakor. Whisk the egg white in a large bowl until frothy. 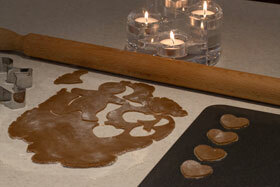 Using a large spoon or a mixer on slow speed, add the icing sugar a tablespoonful at a time. Stir in the lemon juice and beat the icing until it is very stiff and white and stands up in peaks. Cover the surface with a damp cloth if not using immediately. Spoon the icing into a piping bag fitted with a small nozzle and pipe away! Icing is harder than it looks so, unless you are a very experienced icer, I recommend keeping the designs really simple!